EVER CAUGHT BEADS AT A MARDI GRAS PARADE? YOU SHOULD! 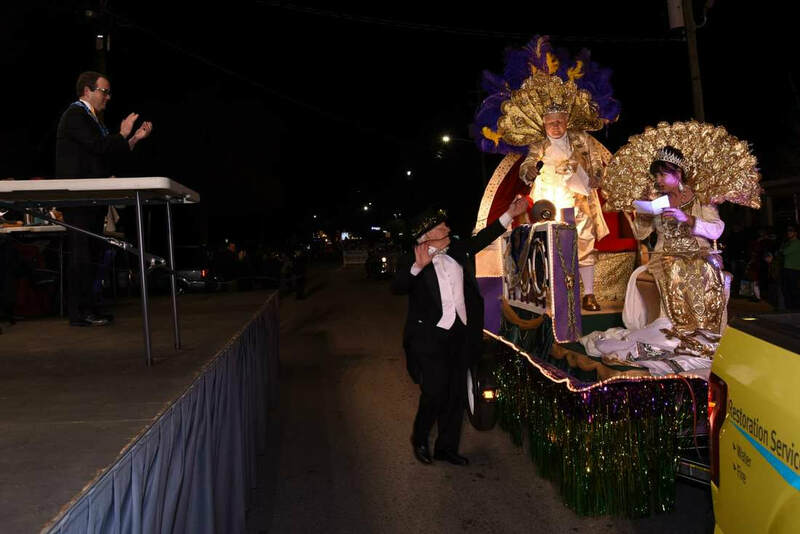 At 7 PM, on Saturday, February 23, 2019 the Krewe of Mask will ‘step off’ in its third annual parade in LaGrange, GA. It will feature floats, throws, beads, doubloons, candy, music and fun. Come out and catch some throws! Bring a bag - your pockets might not be enough. The route starts at Sweetland’s parking lot and goes to Ridley, turns right on Main, to W. Broome, to Bull St, to Church and back to Sweetland. This route should give people the chance to see it twice if they like, and catch twice as many beads, cups and doubloons. People of all ages are encouraged to mask and/or costume for this event. Mardi Gras parades are unique in that there’s not only masking, but crowd participation. One sees someone on a float, maybe gets their attention, then catches thrown trinkets. Kids especially love all the plastic ‘loot’ they get because in a way - they’ve earned it, gathered it, and it’s theirs. There will be an official reviewing stand across from City Hall on Ridley Street. “Best Costume from the Crowd” will be judged there. People wanting to see the parade announced, or to hear our Lord Mayor welcoming the King and Queen back to LaGrange, should gather there. King Peter Anderson and Queen Cheri Anderson reign. We expect a level of Royal opulence in the costuming that has rarely been equaled in this region. We are also very happy to have leading our parade, an advocate for reading and education, Grand Marshall, Debbie Burdette. Prior Grand Marshals Sue Olson and Cornelius Herndon and Royalty such as immediate past King Neal and Queen Trish Lichety will be riding or walking in this enjoyable event. King Peter and Queen Cheri are well known in the community and the biographies should give a bit more insight into the Royal Couple. Queen Cheri writes: Cheri Anderson was born in the birthplace of Mardi Gras and claims Mobile as her home away from our humble LaGrange. She joyfully wishes to establish a tradition of fun, family and frivolity in the season we call Mardi Gras, from Twelfth Night until the eve of Ash Wednesday! A Time for celebration of community fun and revelry for the good people of Troup County! Cheryl and her husband King Peter the 1st are founding members of the Krewe of Mask and dearly love these people whose passion is to bring Mardi Gras joy to others. Cheri's three princes Jeff (and his wife Claire), Andrew, and Wade share her love of the raucous season. Cheri is an honor graduate in accounting from Lagrange College (2000). She loves the LaGrange community where she has worked in banking, accounting and is currently the administrator for Ace Air Etc. She draws strength from and humbly serves her home church of St. Peter’s here in LaGrange. 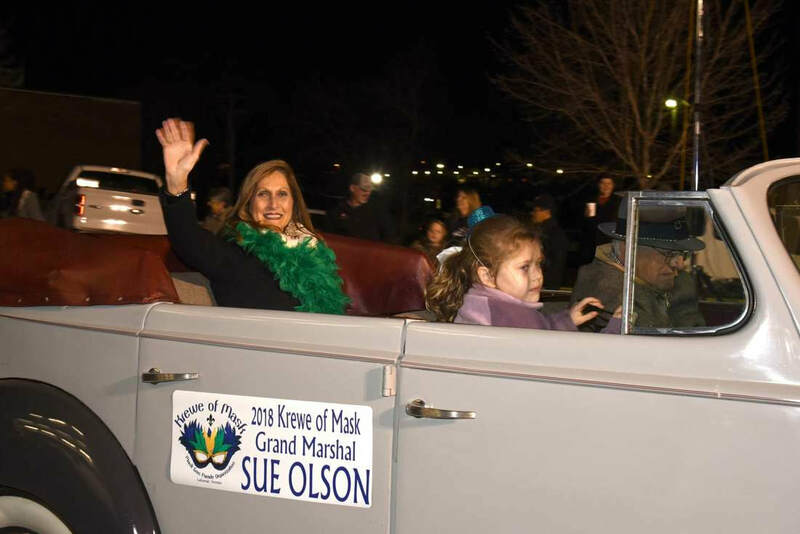 Grand Marshal Debbie Burdette has been involved in Mardi Gras parading since LaGrange’s first Mardi Gras parade. A graduate of LaGrange High School and George Peabody College, she’s volunteered and worked to promote literacy and education in this area. In and out of character, she’s been encouraging reading since 1993 at numerous venues. She’s a Deacon and Elder at First Presbyterian Church. She’s worked as a reading instructor, been a school board member, and has lent efforts to numerous events such as the National Day of Prayer, DASH, Troup Family Connection, and the Azalea Storytelling festival. An exclusive post-parade party will be held that night at the Brick House, starting at 8:30 PM. There will be live music, a cash bar and horderves. A 20 dollar admission is available by pre-paid tickets only. A limited supply of tickets is available and may be purchased by calling 407-408-4831. As part of this event, the Lifesouth Bloodmobile will be present from 2 PM until 7 PM at the Flagpole near the town square for blood donations. ​Further details for the Krewe of Mask Parade may be obtained at www.kreweofmask.com.